Geri Scazzero knew there was something desperately wrong with her life. She felt like a single parent raising her four young daughters alone. She finally told her husband, ‘I quit,’ and left the thriving church he pastored, beginning a journey that transformed her and her marriage for the better. 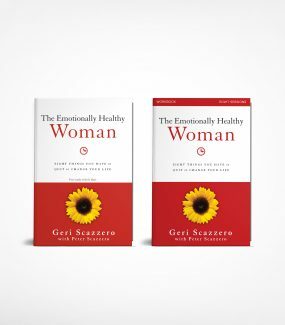 In The Emotionally Healthy Woman, Geri provides you a way out of an inauthentic, superficial spirituality to genuine freedom in Christ. This book is for every woman who thinks, ‘I can’t keep pretending everything is fine!’ The journey to emotional health begins by quitting. Geri quit being afraid of what others think. She quit lying. She quit denying her anger and sadness. She quit living someone else’s life. When you quit those things that are damaging to your soul or the souls of others, you are freed up to choose other ways of being and relating that are rooted in love and lead to life. When you quit for the right reasons, at the right time, and in the right way, you’re on the path not only to emotional health, but also to the true purpose of your life.